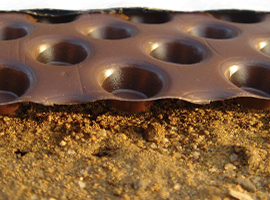 We offer a lot more than just crawl space vapor barriers. Our complete moisture control system includes a wide variety of crawl space products for your home. Here are some steps that we take: The Crawl Space Vapor Barrier System is the heart and soul of our projects. Thus durable, bright white crawl space liner installs on the walls and floors, preventing water vapor and humidity from passing through. By keeping your crawl space dry, you protect your structure and insulation from mold and rot. With a 25-year backed by a nationwide company warranty against rips and tears and covering labor, this durable 20-mil poly-reinforced crawl space liner has 2 polycord reinforcement layers and converts your crawl space into a usable storage area. And with its mold-resistant additive, the System will never support mildew or mold growth on its surface. The products we use are among the most effective under slab vapor barriers in the building industry today far exceeding ASTM E-1745 Class A (Plastic Water Vapor Retarders Used in Contact with Soil or Granular Fill Under Concrete Slabs). The Crawl Space Vapor Barrier installs quickly in your home, attaching to the walls with plastic pegs. Typical jobs take less than a day. Install A Self-Draining Dehumidifier Once you’ve installed your crawl space dehumidifier, you would not want to think about it again. However, if that dehumidifier includes a water collection tray, your dehumidifier may be full to capacity and shut off automatically within hours and you should empty the collection tray. Even in a clean, well-maintained space, it’s a chore most people would pass on if they could. Our Self Draining Dehumidifier has got you covered. With a self-draining design, it can remove up to 110 pints of water per day in your crawl space, without ever needing to have its collection tray emptied. It can empty to a sump pump or drywell, or a special condensation pump can be added to discharge the water outside. Find A Powerful Dehumidifier If you have a dehumidifier in your crawl space, and the area is still damp, musty, and moldy, then you can make an obvious conclusion: it’s not doing its job. Sometimes a crawl space dehumidifier will not stop the mold and rot in a crawl space, but it will slow it down a little. How much damaging fungus is acceptable in your crawl space? Don’t want any? It’s time for an upgrade. The answer is not to buy a second dehumidifier! Twice the units mean twice the noise, twice the electricity used, and very often, a crawl space that is still damp. The upscale crawl space dehumidifier that’s strong enough for the job! Its powerful blowing motor will circulate air throughout your humid crawl space, drying everything out and keeping it dry all the time! Its large cold coil surface (see comparison in photo) helps it handle a 6,000 square foot crawl space, at 3 feet high. Adjustable knob lets you decide how dry you want your crawlspace just set it and forget it! Check for Energy Efficiency Typical hardware store dehumidifiers can really tank up on energy usage! In many cases, these systems can cost you 10, 11 cents or more to remove a single pint of water. One of the main reasons for this is the small cold coils that many dehumidifiers have installed in their system. They just don’t have the power or efficiency to do the job the way it’s meant to be, and as the homeowner, you pay for it. 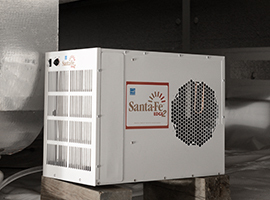 Our upscale Crawl Space Dehumidifier has a unique heat exchange system that helps it achieve an ENERGY STAR rating! Water can be removed at a cost of about 3.3 cents per pint. That means four times as much water from the air, at the same energy usage (6.3 amps). Let us help you dry your crawl space! Call or e-mail us today for a free crawl space dehumidifier quote! Crawl space access wells are often ugly, unsightly pitsby the home. More often they’re made out of concrete, wood, or even metal. Over time, these wells will begin to fill with leaves, plants, and debris. The wood will rot, the metal will rust, and when it rains or snows, they’ll fill with water, flooding the crawl space. At Mold Free Crawl Space, we specialize in crawl space repair. We can install covered crawl space access wells that will not allow water to leak into your crawl space and will never rust, rot, or corrode. 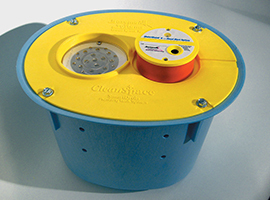 Our top of the line wells we use are made of durable plastic, offered as part of our crawl space vapor barrier system. Providing an airtight cover, it serves as a crawl space access well AND door combined! Made to replace those old concrete, wooden, or metal crawl space access wells, it’s just what you need for a more attractive and long lasting choice. Available in green, brown, and beige, we have a color to match nearly any home. The LONG LASTING access Well is our answer to those old, corroded metal window wells and rotted wood entryways that are such eyesores for some homes. Once installed in your home, it will nicely finish off the outside of your home, complementing the landscaping around your house. A bed of gravel is laid along the bottom of the well, which assists in drainage to help keep out flooding water. This is a fantastic way to improve your home in an easy, cost-effective way! Crawl spaces are shallow structures installed directly into the dirt under your home. As such, they tend to soak up the natural cold of the earth around your home and transfer it into the air in your crawl space. If you have utilities in your crawl space such as your water heater, furnace, or hot water pipes, your energy bills will suffer. This cold will bombard your utilities, forcing them to work harder just to maintain status quo. At Mold Free Crawl Space, we can upgrade your crawl space’s energy efficiency with products that are durable, long-lasting, and made especially for a the crawl space environment. We use a product that is a unique, durable crawl space insulation and liner in one. It’s the first insulation product created specifically for rough, uneven crawl space floors, which can be as cold as 55 °F. 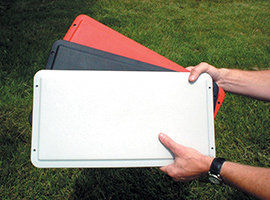 Made for floors and walls alike, this provides a puncture-resistant, padded solution for your crawl space. If you’ve already decided to repair your crawl space and install a liner, this is the product for you. We provide energy-savings and moisture protection at the same time! 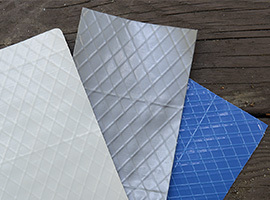 Our Crawl Space Wall Insulation panels look different because they ARE different. Tiny graphite particles permeate its foam insulation to give it that silver/gray shine. These tiny particles reflect heat and lower the material’s conductivity for superior R-value per inch. In addition to resisting heat conduction, Silver Glow boasts a radiant barrier, which reflects heat back into your crawl space for ultimate energy savings. Our crawl space insulation can also be installed on the perimeter of your floor framing system for maximum energy savings. For the best in energy efficiency, combine some of the listed systems above together to keep the cold out and the heat in! The First Custom-Engineered Drainage System For Crawl Spaces! An important part of a sealed crawl space is a reliable sump pump system. Without one, your crawl space will still be vulnerable to groundwater, as well as unnoticed plumbing leaks. Mold Free Crawl Space addresses this need with the Smart Crawl Space Sump Pump. Equipped with a cast-iron sump pump, a reliable liner, a sump alarm, and an optional battery backup sump pump, it’s exactly what you need to ensure a dry crawl space all the time! 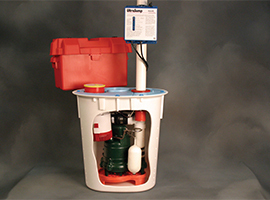 The Smart pump has a very unique lid which accepts the Mold Free Crawl Space liner for a snug seal. Also, any water from a plumbing leak must first pass by the alarm, and will then drain down into the sump. The alarm will sound so you know you have a leak in your crawl space. Crawl spaces often remain wet for days, weeks, and even months without the homeowner realizing there’s a water problem. With the Smart pump Crawl Space Sump Pump, you have the comfort of knowing you’re protected. Along with a cast-iron sump pump, your system includes a floor drain to collect water from plumbing leaks and a water monitoring sump pump alarm that will sound off to notify you of water in the crawl space. Our optional battery backup sump pump can be included, pumping out more than 11,000 gallons of water on a single charge for maximum protection. The smart pump Crawl Space Sump Pump is fully compatible with our complete crawl space vapor barrier system. If you have no groundwater concerns, but would still like to be protected from plumbing leaks, you may also want to consider our crawl space drain system. The Smart SYSTEM is the ideal way to drain water in a dirt crawl space without clogging or drain failure. All openings facing the dirt surface of your crawl space include a special filter fabric material, designed to allow water in while keeping mud and other clogging debris away. As one component of our crawl space repair system, the Smart SYSTEM is a perfect match for our crawl space sump pump, drainage matting, and vapor barrier. Once installed, your home will be protected from mold and damaging rot, creating a healthier, protected home environment.. Direct Water On Your Flooded Crawl Space Floor To Your Perimeter Drain Crawl space liners rest directly on the crawl space floor. If your crawl space is flooding, water can be trapped underneath, never making it to your perimeter drain. The raised dimples on our Drainage Matting gives the water flooding into your crawl space a channel underneath your crawl space liner. This directs the water flooding your crawl space to your perimeter crawl space drain and sump pump system. The Drainage Matting should not significantly add to the installation time of your crawl space vapor barrier system. When we send our crew to your home, one member will lay the drainage matting while another installs the liner over the top. A crawl space system usually installs in less than a day.